It’s in your newsfeed, it’s part of your dinner conversation; it’s seemingly unavoidable. Politics is everywhere — in 2017 more than ever — so when painter and Davis alumna Jennifer Hirshfield tied her smock and picked up her paintbrush, she disregarded her teachers’ warnings to keep paint and politics separate. 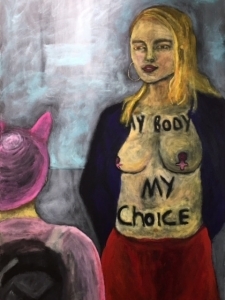 The Santa Rosa based painter’s exhibit, Hineni… Here I Am, is her most recent body of work; it includes portraits inspired by women’s rights and the Women’s March. The exhibit is currently showing at the Walter A. Buehler Alumni Center, where it will remain until March 31. Hirshfield places strong emphasis on this notion of being present. The culmination of her politically-charged art highlights the intensity of politics in everyday life. Hirshfield explained that after she was diagnosed with breast cancer, “being present” became the centerpiece of her solace. She acknowledges that it was this diagnosis that encouraged her to pursue her art more seriously. Her love for art was cultivated during her studies at UC Davis. Graduating in 1987 with degrees in both art and psychology, many of Hirshfield’s art lessons were taught by internationally-recognized painters from the Bay Area Figurative Movement. After many years of painting and teaching, Hirshfield’s art comes full circle; Hineni…Here I Am, is showing on the same campus that kindled her passion in the first place. She hopes, too, that the Pence Gallery may pick up the exhibit. The message behind Hirshfield’s exhibit is pertinent and even assertive, but its explicit imagery is simply necessary. The implications of her art are as poignant as the art itself. But this is exactly why Hirshfield’s art is so pertinent not only in its location, but in its timing. Her paintings tell a story, from start to finish, of a bleak beginning but a powerful, female ending. In “Person, Place, or Thing”, on view October 3rd to November 16th at the Christie Marks Fine Art Gallery in Healdsburg, California, Sonoma County-based painter Jennifer Hirshfield presents cumulative work which investigates the figure, landscapes, and the idea of place. The exhibition ties these ideas together through the use of a rich common palette and like materials. Collectively the works express a range of emotions including joy, sorrow and the excitement of life’s journey. With a Reception on October 18th from 5-8PM and a Conversation with the Artist on October 30th from 6-7PM, visitors will have the opportunity to engage with this “daughter” of the Bay Area Figurative Movement. Considered a master with color, Hirshfield expresses her joyful restlessness through the application of paint with a heavy hand. These particular works enabled her to bring forth and release complex life experiences and emotions common to all, but specific to her journey. Founded by northern California artist Christie Marks, the Christie Marks Fine Art Gallery presents solo and small group shows from local and international artists who are pushing the limits of creative expression. The gallery represents emerging, mid-career and established artists and is located in a historic bank building in charming Healdsburg, California. In addition to the gallery, Ms. Marks is an active art consultant providing services to residential, business and corporate clients. Jennifer Hirshfield-Levine received her breast cancer diagnosis soon after her second child was born. What should have been a time dedicated to raising her newborn child was filled with treatment for one of the deadliest human conditions. Now in remission, Hirshfield-Levine poured her feelings into two series of oil paintings, some of which hang in Sutter Hospital’s breast cancer center. “I first saw Jennifer Hirshfield’s paintings at the Sutter Breast Care Center during their open house last March and was impressed by how they lit up the space around them,” said Dr. Kalane Wong, a Sebastopol ophthalmologist. “After the crowds left, I went back to the radiology waiting room and sat down to quietly appreciate the images. It was such a visual treat to be surrounded by those four large paintings. Hirshfield-Levine wanted patients in the cancer ward to draw energy from her paintings, she said, adding that she hopes her paintings provide inspiration and keep spirits high. She paints solid backgrounds with globules of bright color to help express the balls of energy she personally drew on to help her recover. “I hope (other patients) will feel serenity, peacefulness and calm. I am so grateful I have the opportunity to show my work here,” she said.